When I am mapping an IFS folder to a Windows network drive I know that there are times where I will perform a typo on my password and the IBM i operating system will block me. This is where it gets interesting, I have disabled the user id I use trying to perform this connection, but I can still signon to the same IBM i. What I call the "IBM i" that I use to signon to a 5250 ("green screen") session. 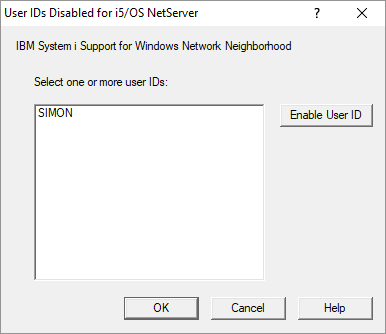 A NetServer user profile, that is used when I use the NetServer functions like mapping a Windows network drive to an IFS share. I do not have to do anything extra to create the NetServer user profile, it appears to be created at the same time the "IBM i" profile is. How can I tell if my NetServer profile is disabled? for Windows Network Neighborhood access. 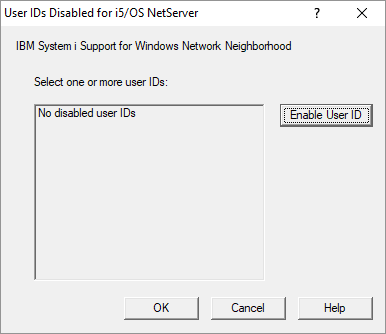 Now I have the bad news, what do I need to do to re-enable my NetServer user id? I click on the plus ( + ) next to "My Connections". Click on the plus next to the IBM i partition's name. Click on the plus next to "File Systems". 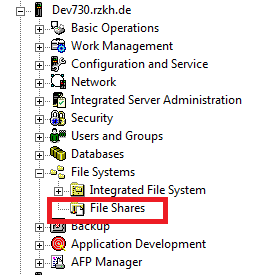 Right click on "File Shares". Select "Open i5/OS Net Server" (yours might be named slightly differently depending upon the version of Operations Navigator you are using). There might be other profiles shown here. Click on the ID, then click on the "Enable User ID" button. My NetServer id has been re-enabled, as it is no longer displayed in this window. The issue with enabling NetServer user ids using Operations Navigator means that this can only be done by someone with a full version of Operation Navigator and the necessary security authorizations. The average user cannot do this for themselves. I was heartened to discover that there is an IBM i API, QZLSCHSI, that can be called to do the same as I just did using Operation Navigator. IBM is even kind enough to give an example in their documentation for this API of a program to re-enable the NetServer id. Line 1: I may want to write another program to call this one and pass to it a user id I want to re-enable. For now the call on the menu passes a blank parameter. Lines 2: This variable will contain the user id of the person who wants to re-enable their id. Lines 3 and 4: These are parameters that are passed to the API when it is called. Line 5: If the user does not have *IOSYSCFG and *JOBCTL special authority they will not be able to run the API. I need the program to adopt the authority of the program's owner, in this case the profile of who created the program object. I do this using the Declare Processing Options command, DCLPRCOPT with the USRPRF parameter of object owner. Lines 7 and 8: I build the parameters that will be passed to the API. The first is the user id, and the second is the length of the first variable's contents. 1 - User does not have *IOSYSCFG authority. 2 - User does not have *IOSYSCFG and *SECADM authority. and the user does not have *IOSYSCFG authority. the owner of the file system directory or output queue. reason code and call the API again. This time I compiled the program using a profile that is the same as QSECOFR. Now when I run this program it enables my NetServer id without error. I did find a mention, in IBM's documentation, of an option on the NETS menu that would allow me to re-enable my NetServer id, but I was unable to find a menu called NETS on any of the IBM i I use. You can load the NETS menus form QUSRTOOL library. I loaded and created a command to run to menu option and allow all users to access and enable themselves. As Dave mentioned, the NETS menu (option 12 I recall) makes it easy to re-enable the disabled users. Have given it to clients so they can do self-service. Presents them w/a simple list that they just use the option to re-enable. I wrote a program that when the user takes the menu option it re-enables their NetServer profile.